WrapStyle Singapore | Premium car wrap | Car foil | Chrome car wrapping | Car styling | Car protection | Car graphics design | Car styling company WrapStyle Singapore guarantees professional quality of cardesign. 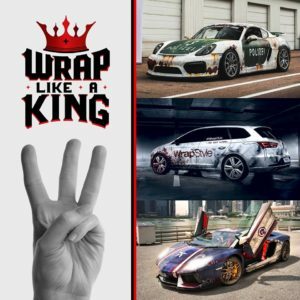 NEW WRAPSTYLE FRANCHISE IN THAILAND! Finally we are in Thailand. 1st stop: Bangkok! We are on fire! We have a new Asian franchise! You can find us here: No. 22/126, Khlong Lam Chiak Road, Nawamin Sub-district, Bueng Kum District, Bangkok Metropolis! Cya all. The demands of our customers grow continuously and it is quite usual nowadays that the customer doesn’t want to choose from our “standard offer” and wants us to create something unusual. Then it’s up to our great designers whose job is to capture the customer’s idea and fulfill their wishes. Sometimes it really isn’t easy to create something that aligns with the customer’s taste. So once in a while we design something and take our chances. In case of this bike it worked out just great! We have created a “rusty” bike with an “old” look. 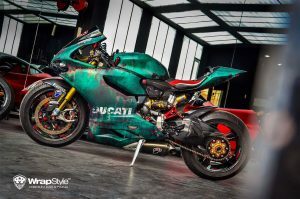 So we left this Ducati 195 HP flagship S1199 Tricolore to rust completely!